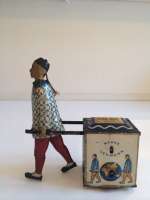 Toy depicts a Coolie with brightly lithographed blue and white shirt, red pants pushing a lithographed cart which depicts other Coolie’s moving merchandise. Very interesting toy and when wound the Coolie’s feet shuffle and cart goes into motion. SIZE: 5-1/2&#8243; t. /W.14 cm. H. 12 cm. CONDITION: Overall very good Literatur­: Heike Köhler und Katharina Kreschel:Vom Störischer Esel zum Kletteraffen Tom.Brandenburger Museumshefte 6, Brandenburg an der Havel 2007. Jürgen & Marianne Clieslik: ­Ein Jahrhundert Blechspielzeug, München 1981. Helmut Schwarz und Marion Faber:Bewegte Zeiten/Moving Times-Ernst Paul Lehmann Patentwerk.Geschichte einer Spielwarenfabrik/History on a Toy Factory, Hrsg.Museen der Stadt Nürnberg 2003. Miniature Ormolu Ormolu Pin Cushion w. Embroidery made by Erhard & Sohne. This tiny Miniature Ormolu Pin Cushion w. Embroidery has a cushion w. petit point embrodery in a lovely tiny Ormolu square box with impressed design made by Erhard & Sohne. It stands on four tiny feet. This Antique miniature is a lovely addition to the ladys desk in the dollhouse. It has has impressed designs on both sides. Lovely condition Size: / 3/4"hx 3/4" /1,5 cm x 1,5 cm) Excellent condition. Circa: 1880.Literatur: Swantje Köhler: Goldenes Puppenstuben-Zubehör. Swantje-Koehler-Verlag. 2007. 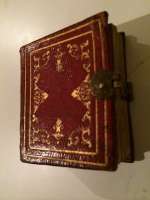 Antique Miniature Leather Photo Album w. 20 DAGUERREOTYPE tinphotos. 1860. 4 x4 cm (1 3/8"x 1 5/8" Red leather photo album with gold impressed decoration the side. Fine original clasp. Ca 1860. Civil war. There are 10 pages with double sides with 20 DAGUERREOTYPE (tinplate photographs) Wonderful accessory for a large scale dollhouse or as accessory for a fine doll.. The leather and tinplates are in fine condition. Hand writed names to a photo at the first side. All original. 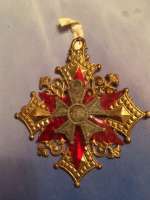 "Hauptmann von Köpenick" made by Lehmann Germany. EPL # 580 This is a very rare figure These were produced in limited numbers over the relatively short period from 1907 to 1918 by Lehmann. Soldier dressed in original clothing. Includes original sword. Condition (Very Good - Excellent).A few stains due to age at his coat. Size 7 - 3/4" T./ 19 cm These were produced in limited numbers over the relatively short period from 1907 to 1918 by Lehmann. Stamped on the feet:EPL 580, the toy was created from an event of the day. A cobbler dressed uniform complete with buttons and belt and sword convinced the officials of the town of Kopenick to give him the municipal treasury for taxes due. 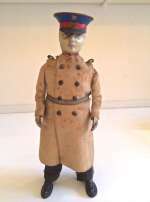 Within a few months after the scam this toy was created.Germany, metal body, full cloth uniform with tinplate hat, clockwork walking action, depicts a noted cobbler who stole the town's money while dressed as a captain, his notoriety was immortalized by Lehmann with this toy. 7 3/4'' H./ 19 cm. Literatur: Heike Köhler/Katharina Kreschel: Vom störischen Esel zum Kletteraffen Tom. Brandenburger Museumshefte 6, Brandenburg an der Havel 2007; Jürgen & Marianne Clieslik: Ein Jahrhundert Blechspielzeug, München 1981. Helmut Schwarz/Marion Faber: Bewegte Zeiten/Moving Times. Ernst Paul Lehmann-Patentwerk. Geschichte einer Spielwarenfabrik/History on a Toy Factory, Hrsg. Museen der Stadt Nürnberg 2003. 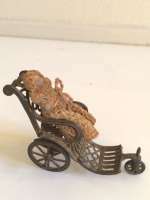 A fine item for the dollhouse is this small golden metal stroller/ pram.It is antique from ca 1900. The condition is very good and original. l.7 cm/ 2-3/4". H. 2"/ 5, 2 cm. Ca 1900. The all bisque doll is sold extra. She is 50 Euro. Provenance: Washington doll Museum. 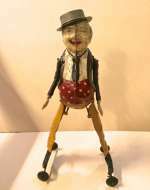 "Foxy grandpa".Handpainted mechanical tin toy fra 20-ties.Günthermann,Germany..Comic toy. "Foxy grandpa". Handpainted German mechanical tin toy. Made by Siegfried Günthermann.Wind up toy.H. 20, 5 cm/ 8 inch. Excellent condition.Comic toy.Ca. 1910.